Pathways brings together professionals, lecturers and past and present students to discuss current trends and employment opportunities in public relations and related industries. During the daylong event, individuals and business representatives took part in a series of industry talks, Q&A sessions and a careers fair. 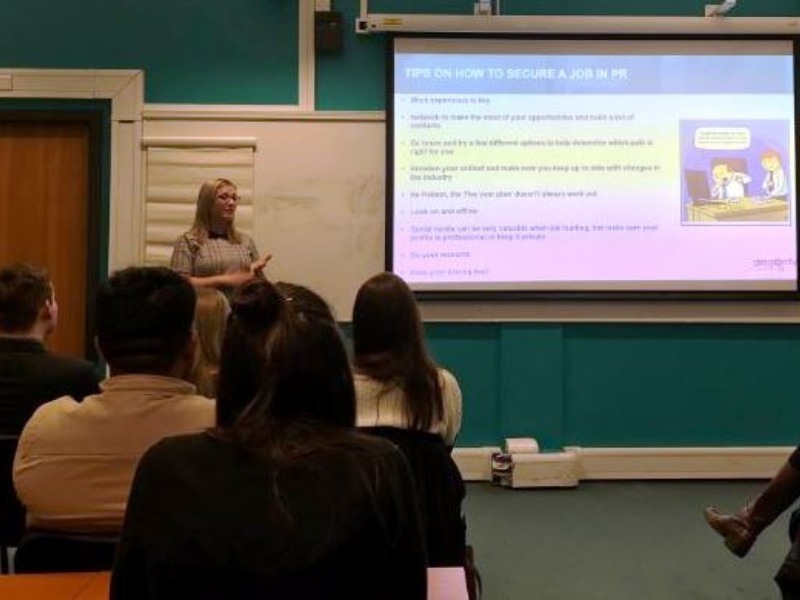 Offering advice to students and recent graduates on how to get ahead in PR, Rebecca delivered a 45 minute talk alongside Steve Miller, Membership and Partnerships Director at the PRCA. Covering a number of points, Rebecca discussed how she managed to get her first role in public relations, through to her current role at Dragonfly PR, including discussing the wide variety of clients the agency services in the manufacturing, construction and food sectors. Finally, pass your driving test to widen your search to outside of city centres and away from main bus routes. Dragonfly PR is a Sheffield based agency with more than 15 years’ experience in planning and implementing succesful PR, social media and SEO campaigns. We are a friendly bunch of Public Relations and digital marketing experts who specialise in business to business PR for companies based in Yorkshire, East Midlands and the North West, with expertise in construction, engineering and industrial and FMCG manufacturing. For more information call 0114 349 5345 or to apply, send your CV and a letter explaining why you would make a great work experience candidate to hello@dragonflypr.co.uk.